Percussionists and fans of musical instrument ornaments will enjoy adding the bongo drums glass personalized Christmas ornament to their tree this year. This set looks fantastic in blown glass, authentic details and a hand-painted finish that gives the drums a genuine brass appearance. 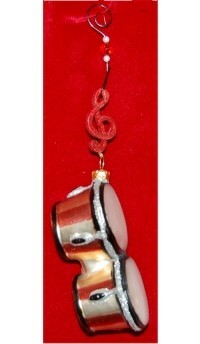 The treble clef hanging wire is a wonderful final touch to the bongo drums glass Christmas ornament. This piece comes on our exclusive velvet bag and is part of a collection of drum ornaments personalized by our artists that includes a matching conga drum.